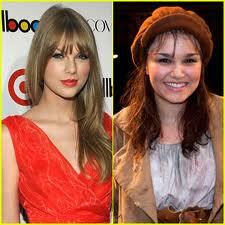 Have you heard Samantha Barks as Eponine sing On My Own? Still stuck on my Les Miserables obsession, the classic book and upcoming movie musical I know many (MOST?) of you are as excited about as I am. As you probably have heard, Taylor Swift, Leah Michelle and even Scarlett Johansson (too old) were on the short list, along with Samantha Barks, to play Eponine. And it looked like a very certain thing that Hoopeer was going with Taylor Swift. I'm so relieved he didn't and went with Samantha Barks instead. She was brilliant. She's not well known enough here in the States to have her own poster - I imagine the marketing in the UK is quite different! UK readers please let me know! Barks was at the screening of Les Miserables I attended last Saturday and took part in the Q&A with director Tom Hooper and Eddie Redmayne (Marius) and Amanda Seyfried (Cosette). At 22, she oozed friendly energy - the kind of person who greets you on first meeting as though she knows you already. Sitting next to her, Amanda Seyfried (Cosette) in her mid 20's and modelling since she was eleven years old, came off as the more nervous and insecure.
" a girl, her mum, and her nana. And they were all three sitting looking up, mouths open, clearly enjoyin' what they were seeing but you knew each one was seeing something different. Each one was seeing it through her eyes." That may be it, why Les Miserables seems to speak to us, to move us so profoundly. The story, the powerful music speak to each of us, no matter our role in life. Samantha Barks first caught her big break when she finished in the top three of I’d Do Anything, a realty show produced by Les Miserables producer, Cameron Mackintosh, to find the actress who would play Nancy in the play Oliver! That was four years ago when she was a mere 18. At 22 she's not going to be stopped. The picture below from the Daily Mail is pretty neat. That's Cameron Mackintosh taking to the stage in a Manchester theater where Barks was playing Nancy in Oliver. The Les Miserables producer took that moment to announce to Barks and the world that Hooper had chosen her! If you aren't sure why Barks was cast as Eponine, check out this youtube video of Barks singing in the 25th Anniversaray of Les Miz on stage. Definitely a good choice. What did you think of Seyfried? Sometimes it feels like she is picked for every singing role. I thought Seyfried was lovely as was her voice. MLH was a bit put off by what he called her bug eyes. Apparently she took singing lessons and has been singing all her life. I know she sang in Mama Mia - but has she done much singing in other films? I'll have to research that.